The Kremlin will pour nearly 52 billion rubles (about $780 million) in 2015 into creating new jobs in the fight to keep rising unemployment in check Although Russia's unemployment rate remains one of the lowest in the world, a growing number of companies are placing employees on an unpaid leave of absence or forcing them to work fewer hours. The Russian government is to allocate nearly 52 billion rubles (about $780 million) in 2015 on fighting unemployment, despite the fact that its unemployment rate remains one of the lowest in the world. 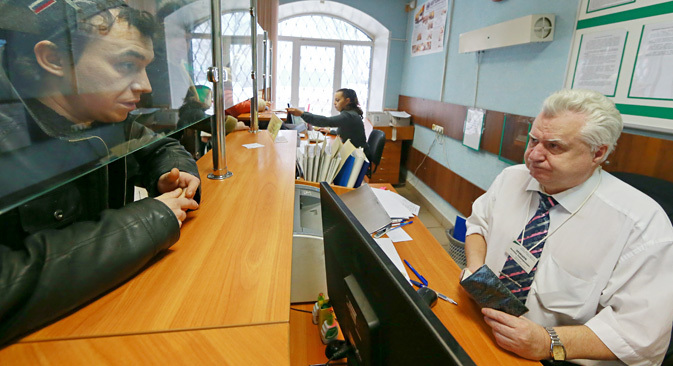 The Russian government has been monitoring the situation on the labor market on a weekly basis since the end of 2014. While according to official figures the unemployment rate is currently about 5.3 percent, the Ministry of Economy predicts a rise in unemployment in Russia to 6 percent by the end of 2015. For comparison, during the 2008-2009 crisis, Russia's unemployment rate increased from 6.2 to 8.3 percent within 12 months. Details of the government initiative have not yet been made public, but based on the experience of 2008, when the country faced similar economic and financial challenges, the key focus is likely to be on helping workers to retrain, while part of the sum may also be spent on subsidizing the expenses of large employers. According to the Ministry of Labor, the number of officially registered unemployed individuals has increased by 3.4 percent and amounted to 903,300 people for the week from 21 to 28 January 2015, which means that about 30,000 people lost their jobs in one week. In addition, the ministry has placed another 235,000 on a list of those expected to be laid off. This mostly includes those employed in the motor-car and machine-building industries, as well as those who work in the production of electrical equipment, construction materials or food. "Businesses who have products for which demand is falling or who do not have enough working capital face big risks now," said says Vera Kononova of the Institute for Complex Strategic Studies (ICSS). According to Kononova, as a result these businesses now largely depend on state support. The most large-scale layoffs are expected in the Chelyabinsk Region, an industrial area located 1,100 miles east of Moscow. Up to 82 percent of workers (6,100 employees) at the local tractor factory are expected to be laid off before May 2015. Meanwhile, the Volvo plant in the Kaluga Region southwest of Moscow is preparing to cut 30 percent of staff due to the suspension of truck production, with the redundancies likely to threaten the jobs of the factory’s white-collar workers as well as its production workers. "The 'risk group' includes marketing specialists, sales managers and lawyers," says Alexandra Polyakova, a leading researcher at the Russian Presidential Academy of National Economy and Public Administration. In its turn, the Ministry of Communications predicts that the number of Russians employed in the media sector will drop by 15-20 percent due to the slump in the advertising market and increased cost of printing. Meanwhile the numbers of those in so-called “hidden unemployment” – workers who are officially employed, but work part-time – continue to soar as companies across the country cut back on staffing. The number of such employees increased by 12.8 percent in the last week of January alone, according to the Ministry of Labor. "In Russia, there are a lot of city-forming enterprises, when all the workers of the city or the region work at the same factory. Therefore, to avoid unnecessary social tensions during a crisis, employers prefer not to lay off employees, but to cut down working hours or force employees to take an unpaid vacation," says Kononova. In most cases, a job at a large enterprise in a company town means a number of social benefits for people, so dismissal is considered a last resort, said Alexander Shcherbakov, a professor of the Department of Labor and Social Policy at the Academy of National Economy and Public Administration. As of 2013, Russia had a total of 342 “company towns” or – cities with one or more city-forming enterprises. In 142 of these cities, unemployment was much higher than the national average. However, Alexandra Polyakova points out that several factors may slow the rise in unemployment – the outflow of migrants from Russia, for example. According to the Federal Migration Service, the number of migrants arriving in Russia decreased by 70 per cent in January 2015 compared to the same period last year. Alexander Shcherbakov agrees. "If there is an outflow of migrant workers, unemployed people or those who are not employed full-time can replace them," he says.